"I do believe that Israel, because of decisions that are being made on a daily basis quietly and without a lot of people seeing them or fully processing the consequences, is heading to a place of danger." Secretary of State John Kerry, in comments at the Brookings' Saban Forum about Israeli government settlement policy and lack of effort in pursuing a two-state solution. Go HERE to read Kerry's comments on Israel. Q. Fateh just held its long-delayed seventh conference in Ramallah and unanimously reelected Mahmoud Abbas (Abu Mazen) to head the movement. So what’s new? Q. What's wrong with Abbas remaining in power? What are the alternatives? Q. Hasn't this at least given us all an extension of peace and quiet on the West Bank? Q. Granted that Abbas's principal effort, backed by people like Rajoub, is to isolate Israel internationally. So isn’t France’s decision last week to label all goods from the West Bank and the Golan as "settlement products" rather than "made in Israel" a blow to Israel? Q. So the French/EU approach is flawless? Q. So where do you stand on boycotting settlement goods? APN's Newest Instagram graphic highlights American support for a UN Resolution on Israeli Settlements. Go HERE to see APN's feed, and to follow it. 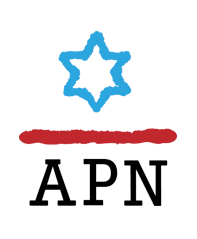 As longtime members of the Conference of Presidents, APN takes issue with the choice of both the partner and venue selected for its Hanukkah party. Azerbaijan's record on human rights and civil rights is dismal, and choosing the Trump International Hotel makes a controversial political statement unrepresentative of the diversity of the Conference's member organizations. Go HERE to read APN's letter. L to R: Jared Kushner, Donald Trump, David Friedman. APN President and CEO Debra DeLee: "Yesterday, we heard David Friedman, one of Trump's top advisers on Israel, say that the two-state solution is not 'the only answer anymore' to resolving the Israeli-Palestinian conflict. Today, we see reports that Jared Kushner, Trump's son in law who was mentioned as potentially being a Middle East peace envoy in the new administration, has been supporting hardline West Bank settlements through the Kushner Family Foundation that he directs. Last month, we heard another one of Trump's senior Israel-affairs advisers, Jason Greenblatt, say that West Bank settlements are not an obstacle to peace..."
The letter includes reference to Mike Flynn's hostility to Islam and his retweeting of an anti-Semitic tweet as indications that he is unfit to serve as US National Security Adviser. Senator George Mitchell, appointed by President Obama as Special Envoy to the Middle East in 2009, and Alon Sachar, who served with Senator Mitchell and in other US positions connected to Israel and peace negotiations, will discuss their newly released book A Path to Peace: A Brief History of Israeli-Palestinian Negotiations and a Way Forward in the Middle East. The book has been described as providing "a practical roadmap for bringing peace to this complicated, troubled region." Peace Now has reported the news that the settlers from the Illegal Outpost of Amona who are court-ordered to leave, will be moved to nearby land also confiscated from Palestinians. The Israeli government claims these lands as "absentee property", which until now has legally not been allowed for use in establishing settlements.